This highly original, 2-owner 1971 XKE Series II Roadster is a matching numbers car with a mere 76,336 original miles showing. A solid car that is full of patina, the E-Type presented here is free of rust, bondo, and hits, and has been professionally serviced with new points and a condenser. The car comes in its original color combination of brown with a beige leather interior, and rests upon on a set of Chrome Wire Wheels that are nicely matched with (4) Pirelli Citurato radial tubeless tires, that include a full spare. There is excellent chrome throughout, and the body and panel fit exceptionally well. The car's engine bay is clean with the original factory emission sticker, chrome excellent throughout, and the car retains the original felt found between the radiator guard and bonnet. 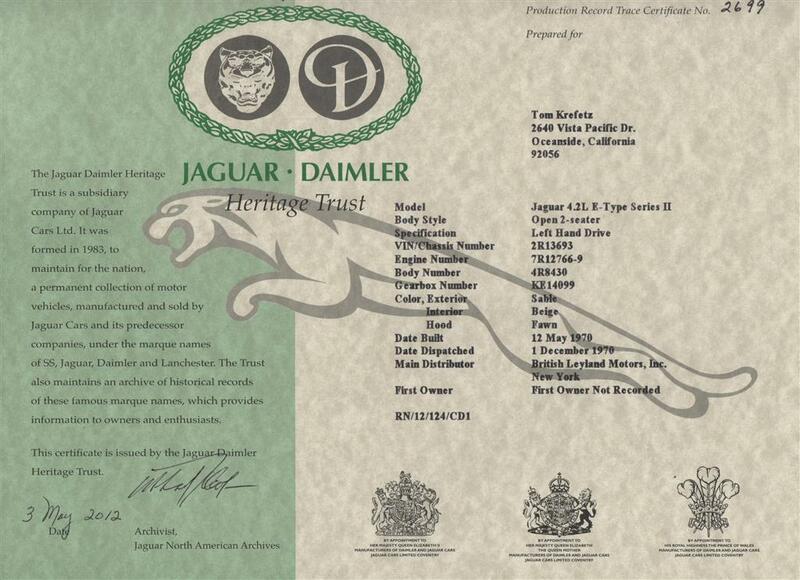 The roadster comes with it's original Jaguar Passport, A/C booklet, Owner’s manual, Pioneer radio manual, work receipts, records, and tools. The E-Type has several desirable factory features as well, including A/C, an external luggage rack, and side view mirror. This model was produced at the end of the XKE 6 cylinder production run, shortly before making the switch to the XKE 12 cylinder, making this particular E-Type a very collectible model to own. Whether you plan to fully restore or simply collect as-is, this original E-Type roadster presents the collector with a unique opportunity to own a well preserved and highly iconic XKE model. 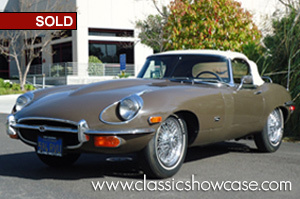 The Series II XKE is very desirable because of its comfortable reclining seats as well as head rests that were adjustable for height, improved cooling system, and dual fans on the radiator. This is the end of the 6 cylinder XKE era. Leaping cat emblems were only placed on the side of the 1971 XKE bonnet and are a very unique addition and symbol of this series. While the Series II E-type was more radically altered than its interim predecessor, the essential construction remained the same and the body work differed only in detail. Modifications were made to the front of the bonnet, increasing the size considerably, the headlamp scoops were altered so that the inner walls now splayed inwards and the side/flasher were rather larger and positioned below the raised bumper. The vehicle also received heavier front bumper blades, motif bar, front and rear over-riders were changed, new square number plate at the rear, a different grille was used in the rear of the bonnet bulge, and the washer jets were finished in satin chrome to avoid the risk of dangerous reflections.